Steamed Squid with Lime Sauce in Thai called "Pla Meuk Neung Ma-Nao". This delicious squid preparation is an excellent fresh and healthy side dish. 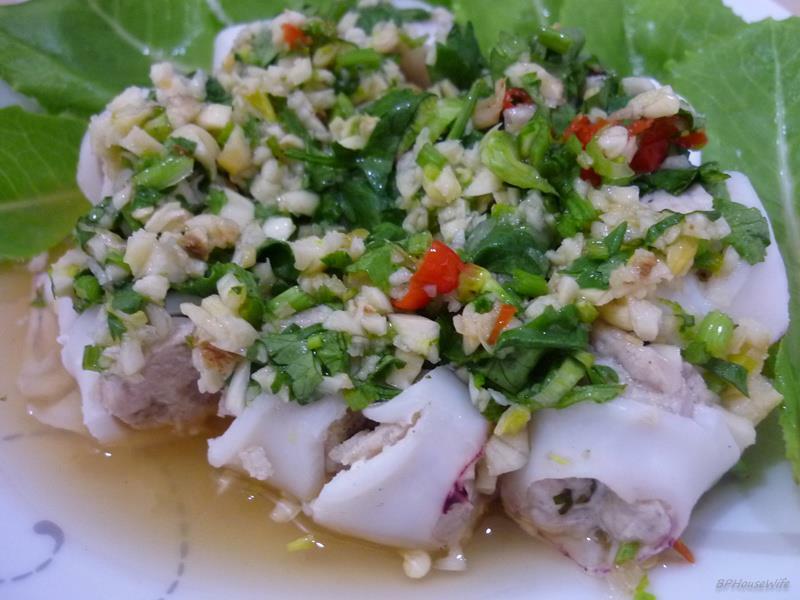 It is a sour, sweet, salty and spicy steamed squid typical in Thailand and Laos. Literally, the words " Pla-Meuk Neung Ma-Nao " are derived from three Thai words: "Pla-Meuk", "Neung" and "Ma-Nao". "Pla-Meuk" refers to squids. "Neung" mean steam and "Ma-Nao" refers to limes. the chicken mixture into the prepared squids until almost full. knife to make 3 to 4 cuts on the squids. Set aside. should be tangy-a balance of salty, sweet, spicy, and sour. too sour, or more chilies if not spicy enough for your taste. until done, about 6 to 7 minutes. over the squid and garnish with the coriander leaves.